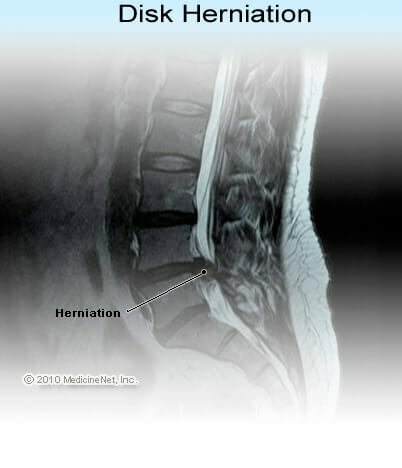 What Is Slipped Disc (Herniated Disc)? What Are Causes and Risk Factors of a Slipped Disc? What Are Symptoms of a Slipped Disc? When Should Someone Seek Medical Care for a Slipped Disc? What Exams and Tests Do Health Care Professionals Use to Diagnose a Slipped Disc? What Are Home Remedies for a Slipped Disc? Which Health Care Specialties Treat a Slipped Disc? What Medications Treat a Slipped Disc? Is Surgery an Option for a Slipped Disc? What Follow-Up Is Needed for a Slipped Disc? What Is the Prognosis of a Slipped Disc? 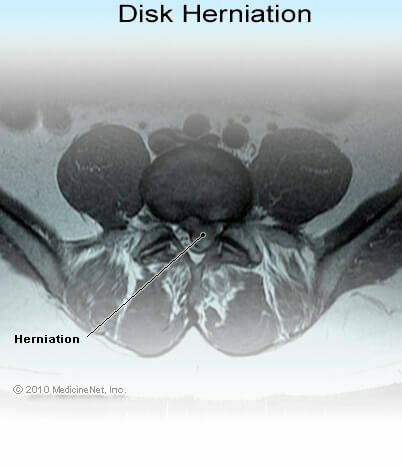 Many people experience no symptoms from a herniated disc, and the majority of people who have herniated discs do not need surgery. The layman's term "slipped disc" is, therefore, a misnomer and actually refers to a condition whereby portions of an abnormal, injured, or degenerated disc have protruded against adjacent nerve tissues. This condition is also known as a slipped disk, herniated disc, ruptured disc, or prolapsed disc. The most frequently affected area is in the low back, but any disc can rupture, including those in the neck. Risk factors that lead to a slipped disc include aging with associated degeneration and loss of elasticity of the discs and supporting structures; injury from improper lifting, especially if accompanied by twisting or turning; and excessive strain forces associated with physical activities. Sudden forceful acute trauma is an uncommon cause of a slipped disc. For slipped discs in the neck: Neck symptoms and other associated symptoms include numbness, tingling, weakness, or pain in the shoulder, neck, arm, or hand. Symptoms of a herniated disc in the neck often increase or decrease with neck motion. You should consult with your doctor for any neck or back pain significant enough to limit activity, any back pain that lasts more than a few days, or any neck or back pain associated with numbness or weakness, loss of bladder or bowel control, fever, or abdominal or chest pain. The doctor may suggest an urgent office evaluation or may advise you to go to the hospital's emergency department. Any injury that may suggest more significant back or neck problems, such as a fall from a height or a direct blow to the spine, should be evaluated at the hospital's emergency department. Consider calling 911 for an ambulance. Medical teams can immobilize the spine and protect against further damage. The doctor will take a complete medical history and perform a thorough physical examination with special emphasis on the neurologic examination. This history will include questions about other illnesses, prior spine problems, arthritis, injuries, duration and type of symptoms, and response to treatments. The examination includes a spine examination, testing of basic nerve functions, an abdominal examination, and a general screening. Often no diagnostic tests are needed for adequate treatment. In certain situations, imaging studies or laboratory tests of blood and urine may provide your doctor further information necessary to establish a diagnosis. If needed at all, they may not be necessary immediately for a diagnosis. Sometimes they are ordered later if basic treatments fail to improve your condition. Plain X-rays (and even computerized axial tomography, CAT scans) cannot depict a prolapsed disc and can only identify bony abnormalities. These X-rays are best used to evaluate back pain that is from causes other than a prolapsed disc, such as bony displacement, tumor, or broken bone. Most young or middle-aged people without a history to suggest trauma or suspicion of a tumor are best served without the expense and radiation associated with obtaining these X-rays. In most cases, the bones seen on X-ray are normal. More specialized tests include magnetic resonance imaging (MRI) or myelogram (which involves injecting a contrast dye into the spinal column). These are ideal for diagnosing a deformed disc and how a specific nerve is affected. In the absence of signs or symptoms suggesting severe nerve damage, however, these studies are very rarely necessary early in the course of the evaluation. This is because of the fact that the findings rarely affect initial treatment decisions. Your doctor may obtain these tests after a course of treatment fails to provide you relief over a period of four to six weeks. A bone scan can detect infection, healing fractures, or tumors. This test is rarely ordered as part of an emergency evaluation but may be part of a further evaluation to find the cause of your symptoms. Minor cases can be handled at home in consultation with your doctor. Treatment at home will likely include application of hot or cold packs, limited activity (although strict bed rest is not generally advised), and basic pain relievers such as acetaminophen (Tylenol), naproxen (Aleve), and ibuprofen (Advil, Motrin). As your condition improves, specific neck or back stretching or strengthening exercises may be suggested. Physician specialties that evaluate and treat slipped disc range from generalists to subspecialists. These specialties include general medicine, family medicine, internal medicine, gynecology, orthopaedics, neurosurgery, rheumatology, pain management, and physiatry. Other health care providers for low back pain include physical therapists, chiropractors, massage therapists, psychologists, and acupuncturists. The doctor often prescribes rest or limited activity for several days followed by gradual increase in activity over the next few weeks. Strict bed rest is generally not advised because people with back pain have been shown to recover more quickly with normal activity as long as lifting, bending, and straining are limited. Physical therapy, exercise, and massage can be helpful if indicated (always check with your doctor before resuming any stressful activity). Anti-inflammatory medications, such as ibuprofen (Motrin) and others, may be recommended. These can generally be safely taken with acetaminophen (Tylenol) as home remedies for a slipped disc. Medicines to relax the surrounding muscle tightness and spasms are sometimes used (cyclobenzaprine, [Flexeril] or diazepam [Valium]). A short course of a medical steroid (corticosteroids, similar to cortisone), such as prednisone, prednisolone, and methylprednisolone (Medrol), also may be used. Injections of cortisone (Depo-Medrol, Kenalog) can help suppress the inflammation and therefore the associated pain. For pain relief, narcotic medication is sometimes added for a short period of time. Sometimes, drugs that treat "nerve pain" such as gabapentin (Neurontin), pregabalin (Lyrica), or tramadol (Ultram) can help relieve the pain. If the medical measures are not successful within a reasonable time (6 weeks or more), and the tests confirm a herniated disc as the source of symptoms, surgical repair may be considered. Except in extreme situations or in those that have a high potential for permanent nerve damage, surgery is not considered early. Neck surgery and back surgery are serious procedures and considered under specific situations where unrelenting pain and risk of permanent damage to nerve tissue exists. Frequently, time and basic spine care resolve most slipped disc symptoms without the need for operation. Several surgical options exist. Your doctor will refer you to a spine surgical specialist (an orthopedic or neurosurgeon) to discuss which option is best for you and what the likelihood of success will be. Follow your instructions carefully and do not overexert yourself too soon. Your initial treatment plan may need to be extended or modified based on your response. Regular exercise can improve the overall strength and tone of the supporting muscles and structures. Low back exercises are particularly important to prevent recurrent back injury. Use proper techniques while performing strenuous exercise and strenuous work, including lifting. Lifting should be done with the legs performing the work, not the back. The worst possible combination of activities for your spine is heavy lifting while bending and twisting simultaneously. Use of a spine brace during heavy lifting may be advised. Its proper use is to keep your back straight and encourage proper lifting technique. It should not be used as a substitute for proper technique or to encourage you to exceed safe lifting limits. If the patient is overweight, losing weight can help decrease the back pain. The vast majority of disc problems improve without any surgical intervention. Most people are able to return to normal function (with emphasis on protecting the spine from recurrent or new injury) within a short time. It is not unusual for similar symptoms to return in the future, however. Therefore, long-term maintenance exercise regimens are recommended for prevention of reinjuring a slipped disc. What symptoms did you experience with your slipped disc? What treatment did you receive for your slipped disk?